I had been using Moroccanoil for a while now and I was given a sample of Orofluido Beauty Elixir and ended up switching to using it. I like Orofluido more than Moroccanoil and have been using it regularly since 2011. I originally posted this blog post August 20th, 2011 and have since updated it with more details. Orofluido Beauty Elixir smells amazing of amber and vanilla and the scent lasts throughout the day. Orofluido leaves my hair very soft, silky and gives it a beautiful shine. It doesn’t weigh down my hair at all like some oil products. 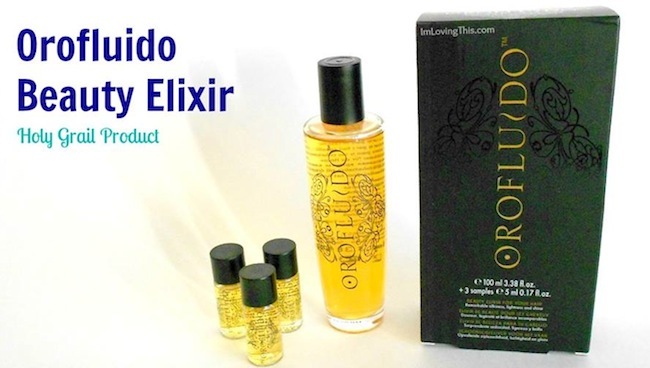 There are three miracle workers in the Orofluido Beauty Elixir. Argan oil is rich in vitamin E and essential fatty oils and helps strengthen hair. Cyperus oil contains unsaturated fatty acids and tocopherals which give natural protection against free radicals. It helps make hair voluminous, leaving it manageable, smooth and flexible. Linseed oil contains unsaturated fatty acids that seal and smooth the hair cuticle which adds a beautiful shine to your hair. To use just pour a few drops of the Orofluido onto the palms of your hands and apply to damp, towel-dried hair. Then style your hair as usual. I use about a dime-nickle size amount every time I wash my hair before blow drying. You can even add it to dry second day hair as well to make it look more polished. I often apply it to the ends of my second day hair to make my ends looks smooth. This oil last forever, I’m only on my second bottle since 2011. I do have hundreds of hair products so it doesn’t get used on the daily cause I try out other ones. But I still think it will last you a decent amount of time. I found my most recent bottle that came with the 3 travel size bottles at Winners for only I believe $18. What a steal! So keep your eyes out for it there. I haven’t seen it since but if I do I’ll be snatching them all up.